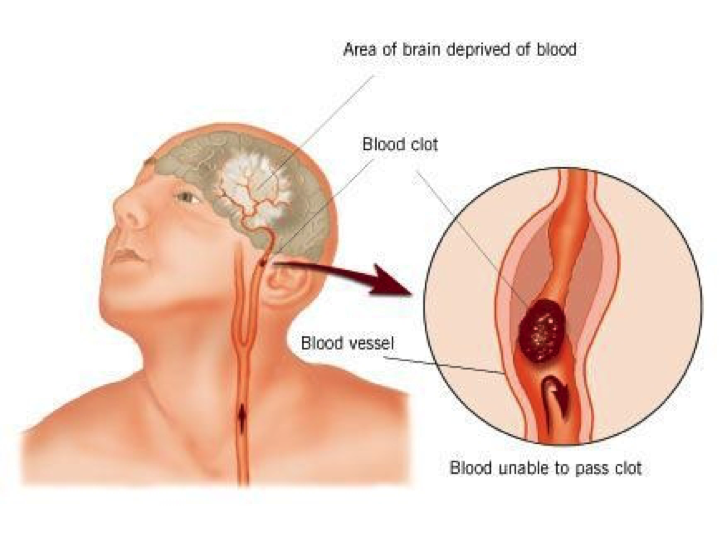 A diagram of what happens to the body to cause a stroke. All episodes of Brain Stroke should be evaluated by a trained medical professional, as soon as possible! DO NOT wait! Failure to obtain evaluation as soon as possible may result in serious injury or death. Call 911 (or your local emergency number) immediately, if you are experiencing a Brain Stroke. What are the Causes of Brain Stroke? A Brain Stroke occurs when the flow of blood to the brain is reduced or blocked. A lack of blood flow to the brain deprives the brain of oxygen. When brain cells do not receive oxygen, they begin to die, resulting in a loss of function in that area of the brain. Any cardiovascular disease including heart failure, heart defects, abnormal heart rate, etc. The above symptoms may have a sudden onset with no known or explainable cause. How is First Aid administered for Brain Stroke? DO NOT only turn the individual’s head, if he/she is vomiting; instead, move their head, neck, and entire body, to one side. Who should administer First Aid for Brain Stroke? Any individual near the affected person or a qualified healthcare personnel may administer First Aid for Brain Stroke. However, a medical professional is required for further treatment and management of the condition. What is the Prognosis of Brain Stroke? Brifault, C., Gras, M., Liot, D., May, V., Vaudry, D., & Wurtz, O. (2015). Delayed pituitary adenylate cyclase–activating polypeptide delivery after brain stroke improves functional recovery by inducing M2 microglia/macrophage polarization. Stroke, 46(2), 520-528. Campos, F., Pérez-Mato, M., Agulla, J., Blanco, M., Barral, D., Almeida, Á., ... & Ramos-Cabrer, P. (2012). Glutamate excitoxicity is the key molecular mechanism which is influenced by body temperature during the acute phase of brain stroke. Plos one, 7(8), e44191. Suzuki, K., Morita, S., Masukawa, A., Machida, H., & Ueno, E. (2011). Utility of CT perfusion with 64-row multi-detector CT for acute ischemic brain stroke. Emergency radiology, 18(2), 95-101. Mdzinarishvili, A., Sutariya, V., Talasila, P. K., Geldenhuys, W. J., & Sadana, P. (2013). Engineering triiodothyronine (T3) nanoparticle for use in ischemic brain stroke. Drug delivery and translational research, 3(4), 309-317. Hyun, H., Lee, J., Kim, S., Hyun, D. K., Choi, J. S., Lee, J. K., & Lee, M. (2011). Combinational therapy of ischemic brain stroke by delivery of heme oxygenase-1 gene and dexamethasone. Biomaterials, 32(1), 306-315. Mustafa, S., Abbosh, A., Henin, B., & Ireland, D. (2012, December). Brain stroke detection using continuous wavelets transform matching filters. In Biomedical Engineering Conference (CIBEC), 2012 Cairo International (pp. 194-197). IEEE. Mobashsher, A. T., & Abbosh, A. (2014). Development of compact directional antenna utilising plane of symmetry for wideband brain stroke detection systems. Electronics Letters, 50(12), 850-851. Sinanović, O. (2010). Neuropsychology of acute stroke. Psychiatria Danubina, 22(2), 278-281.